Hey guys! This is the last of my Fourth of July looks! 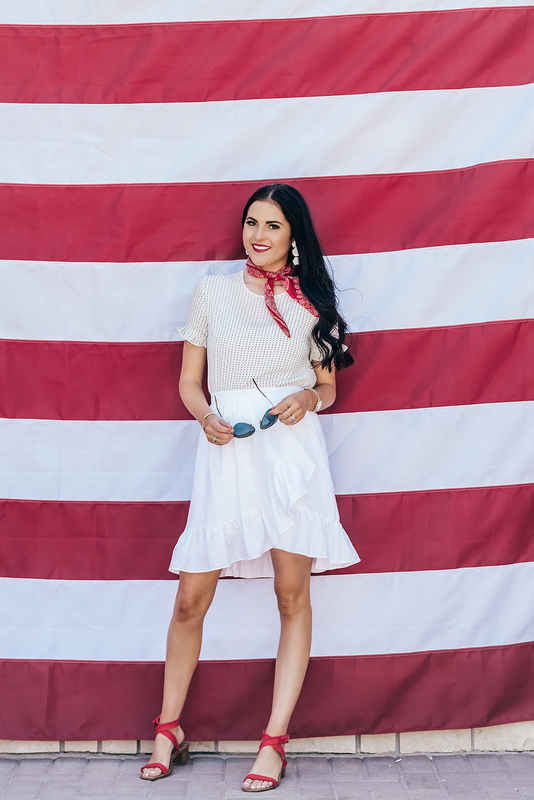 I’ve been wearing this skirt a lot this season and this Rachel Parcell top is the perfect feminine tee and will be restocking in more sizes soon, so stay tuned! Add a bandana, some statement earrings and a bold lip and you’re ready to go! And I just realized that Early Access for the Nordstrom Anniversary Sale starts exactly one week from today! It’s for sure the best sale of the year!!!! I can’t wait to snag some amazing pieces for fall and share them all with you; get ready! The combination of white and red colors always was really good! And I love how styled the colors on the outfit! That top is so cute! Seriously loving everything from you collection. Pairs so well with the ruffled skirt! So cute! I’m loving all your bandana looks lately. Very festive. This look is so cute! I especially LOVE the bandana! Can’t wait for the Nordstrom sale!!!! Your scarf was the perfect finishing touch to this look! Love it! Thanks so much! I’m loving bandanas this summer! This look is SO cute…love that little ruffled skirt! I love this top. So cute! This is such a cute outfit and the tee is very beautiful! love those sandals! I’m totally loving this festive and chic outfit! I love how you used the flag as the backdrop for your photos. The outfit is so classic for the holiday! So cute and patriotic without being costumey! I’m basically never going to get tired of this background! Lovely outfit plus those sandals are super cute! so in love with the red heels and skirt! Love those sandals. I just think you look fantastic in red! Love your J.Crew earrings! I just bought 3 pairs! J.Crew has the best stuff right now!! You look amazing!! I love that outfit. I also love how you always look great without showing too much! Beautiful outfit. I like the red accents. I absolutely love this post, I love the white outfit, red shoes and the even the background is perfect. I love the makeup. You look simply amazing.